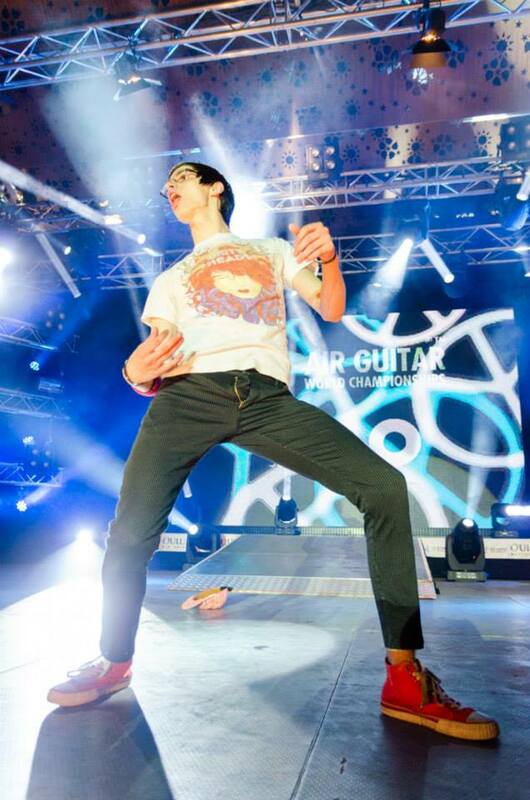 It is tempting to reduce air guitar to shallow imitation of authentic musical performance, but air guitar is not really mimicking as much as it is its own performance. Air guitar playing makes sense to audiences because it invokes physical and musical referents that nearly all of us know. In some ways, this is much like Elvis performance artists, who are not “impersonators” as much as they interpret threads of popular musical consciousness. Where Elvis performance artists do sing, air guitar may be distinguished by its celebration of the pleasure so many of us take in music we cannot hope to play and the optimistic democracy of air guitar. The compelling fundamental attraction of air guitar is that it appears so simple and accessible to all of us with the faintest musical sentiments and a suppressed desire to strut about with Angus Young’s theatrical lack of self-consciousness. US Champion and 2014 world runner-up Matt ”Airistotle” Burns (image Aleksi Ollila). This is what makes air guitar such a rich if surprising foil for the plea for world peace: it is a universally accessible performance of the warm feelings and pure pleasure induced by music. This diverges quite radically from the wave of musical stardom shows like American Idol, which confirms on a weekly basis that singing well is a rare talent. Where American Idol revels in the mean-spirited public humiliation of singers with misplaced confidence, air guitar has an astoundingly good humor about itself, celebrating its self-effacing performance and a common embrace of music. 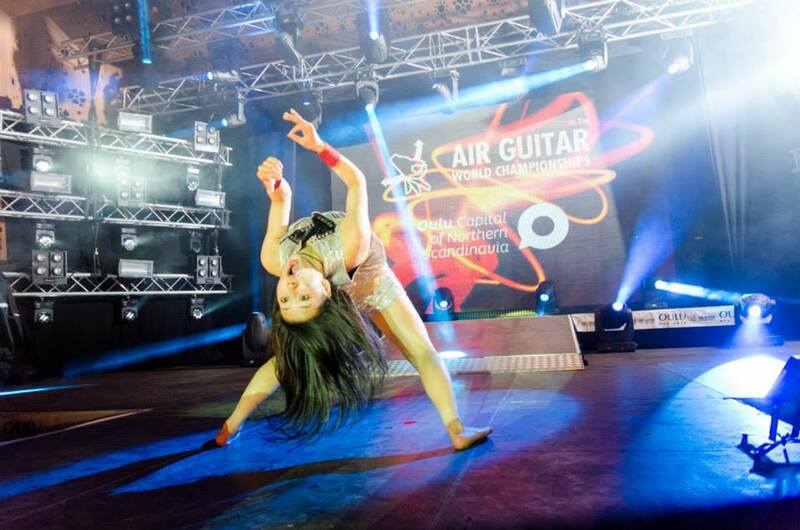 There are ambiguous criteria for what constitutes a “good” air guitar performance, but there is a scored contest, and Nanami ”Seven Seas” Nagura of Japan was crowned the 2014 world champion last week. It may be that what separates the legion of air guitarists from the elite in Oulu revolves around the performers’ capacity to act out their emotional response to music in a charismatic and convincing way: an air guitarist aspires to induce us to join in their pleasure with the music (compare the 2005 analysis of air guitar by Dan Crane, who has been host of the World Championships since 2006; the creative mindset of air guitarists–and some peoples’ resistance to it–may be nicely captured in the video from the 2003 movie “Air Guitar in Oulu”; and Byrd McDaniels’ blog gives air guitar some thoughtful scholarly respect). 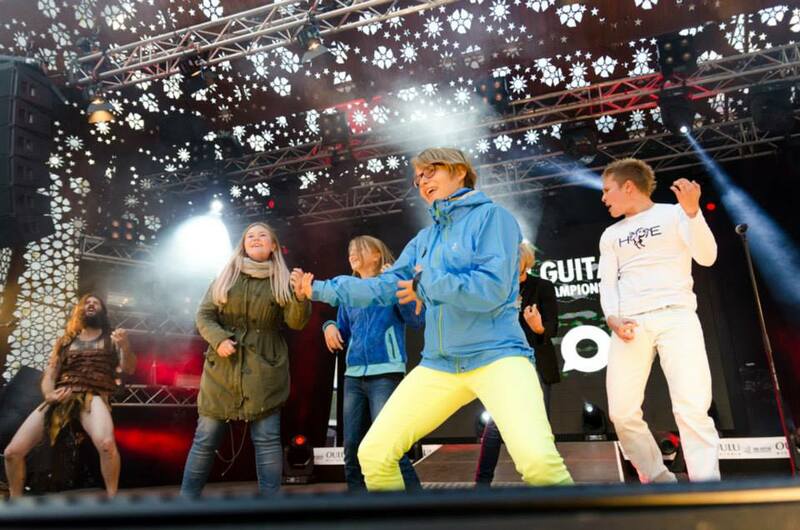 Pleasure in air guitar has no especially formal standards; that is, the politics of air guitar and its audacious call to global peace are a quite simple public expression confirming the joy of music and performance in a consciously democratic art we can all share. Nanami ”Seven Seas” Nagura accepts the final award (image from author). Air guitar performance is an enormously clever if unexpected simplification of conflict, idealistically brushing aside all sociopolitical complexities from real world unpleasantness. Key to this enchanting and naïve diplomacy is air guitar’s self-awareness of its insignificance, if not its camp status. Air guitar’s pretensions for the loftiest of goals—peace, cultural understanding, art, community—counter-intuitively come from the least self-important of all arts, a people’s folk expression in which its most prominent performers and their desires seem to be indistinguishable from those of our neighbors. It may be a rhetorical hyperbole to suggests that if the planet is playing air guitar there will be no warfare or violence; nevertheless, it is difficult to refute the sentiment and doing so would only ignore air guitar’s improbable skill cutting to the profoundly consequential emotion, pleasure, and community invested in music, performance, and something as seemingly insignificant as air guitar. 2006 Playing “Air Instruments”: Mimicry of Sound-producing Gestures by Novices and Experts. In Gesture in Human-Computer Interaction and Simulation, pp.256-267. Springer, Berlin. 2009 Home Dance: Mediacy and Aesthetics of the Self on YouTube. In The YouTube Reader, eds. Pelle Snickars and Patrikc Vonderau, pp. 390-406. National Library of Sweden, Stockholm. 2006 To Air is Human: One Man’s Quest to Become the World’s Greatest Air Guitarist. Riverhead Books. 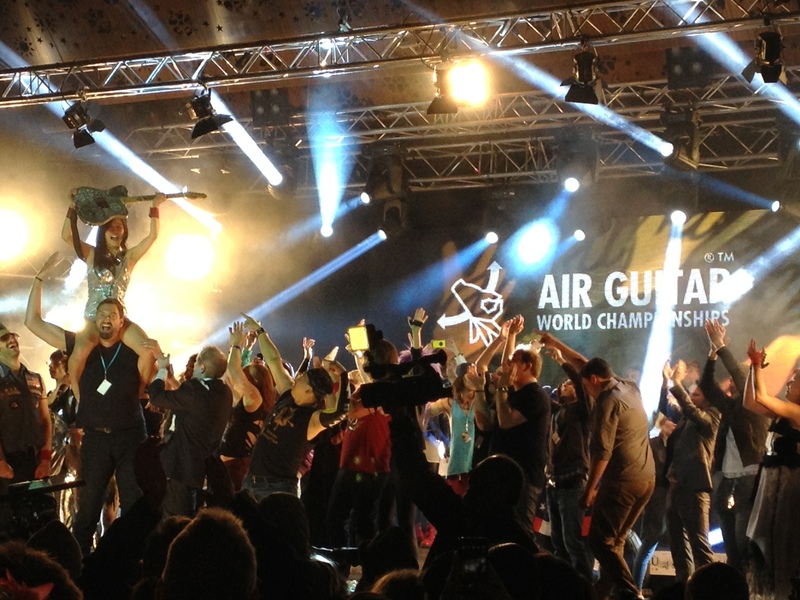 Posted on September 1, 2014, in Uncategorized and tagged #AGWC, air guitar, Air Guitar World Championships. Bookmark the permalink. 3 Comments.